Quick update on M Winkworth (WINK). Summary: A somewhat better set of figures than I had been anticipating from this estate-agency franchising business. The second-half looks to have been bolstered by extra franchisee fees, which helped WINK register a decent second half and improve its cash flow. Margins and returns on equity remain superb at 31%, the shares do not seem over-priced — but will the Internet crush the income of traditional estate agents? I just don’t know, but continue to hold. I’m glad WINK has improved the efficiency of its financial reporting. WINK has extremely simple accounts and yet, for the past two years, it had published its December-end annual results during mid-to-late April. For 2013, the figures were published as late as June, while prior to that they were published in May. As far as I know, the group’s finance director remains a part-time employee. A trading statement in November had previously warned of a slowing London housing market, and signalled 2015 revenue would be in line with 2014 — but with profit “slightly below expectations”. As such, I had pencilled in revenue of £5.5m and an operating profit of almost £1.6m for today’s figures. However, it turns out that revenue was close to £5.9m and operating profit topped £1.8m. Looking back at WINK’s November announcement and then its declaration of a special dividend in December and then its more optimistic statement in January, I get the impression the group enjoyed a bumper December that looks to have continued into 2016. WINK confirmed its estate-agency franchisees generated gross revenue of £49m during 2015 — down 2% on 2014. I reckon most of WINK’s extra revenue has come from fees relating to new franchisees — 10 franchisees either opened a new or bought an existing WINK branch last year. But maybe some of the extra revenue has come from the growing lettings side of the wider WINK network. Lettings currently represent 38% of WINK’s network franchisee revenue, and the group continues to target further rental properties to one day enjoy a 50:50 split. Either way, a larger slice of gross franchisee income alongside a greater dependence on more reliable lettings income are both welcome developments. I am pleased WINK’s cash position improved during the second half of the year. Within the interim results, I noted the cash position had shrunk by £0.4m to £2.1m as the group continued to loan extra money to its franchisees. Well, i) and ii) may have started to occur during H2. It’s also worth noting the amount of annual interest WINK received last year. True, £90k is not large compared to the £1.8m operating profit. But it is money earned mostly from lending cash (probably about £1m or so right now) to franchisees to help start their operations. Right now, the implied rate of interest on these franchisee loans is much better than that available in a standard deposit account! All told, I reckon WINK’s effective cash position is about £3.9m if you factor in the franchisee loans and subtract the recent special dividend payment. The business continues to operate without any debt, too. * Structural threat of online agents? Some 81% of WINK’s revenue comes from its London branches and while stamp-duty changes and the EU referendum have created some uncertainty within the capital’s housing market, a more fundamental problem for WINK is the growing presence of online estate agents. Recent results from Purplebricks (PURP), which describes itself as a ‘hybrid’ online agency, has provided an insight into the possible future of estate-agency fees. In particular, PURP’s average selling fee comes to £1,080 including VAT. WINK does not disclose its average selling fee, but London rival Foxtons (FOXT) has revealed its average selling fee is £12,990 based on an average selling price of £550k. I suspect WINK’s fees are not as high as those of FOXT, while PURP does charge more for selling London properties. Nonetheless, saving up to £10k commission on a house sale must be attractive to some vendors in London. I have spent some time thinking about the advent of PURP and the effect it will have on WINK, and I must confess I have still not arrived at a firm conclusion. On the one hand, some people will always want to pay a bit extra for the advice and assistance they receive from a traditional agent. But on the other hand, some people will always see estate agents as greedy middlemen that do nothing but place adverts on Rightmove. My best guess right now on the future of estate agency is that traditional and online agents will co-exist, but the fees charged by the former will probably reduce over time. That fee trend could impact WINK and its franchisees — and I guess there is the chance the likes of WINK could suffer a structural upheaval similar to that experienced by the newspaper sector. 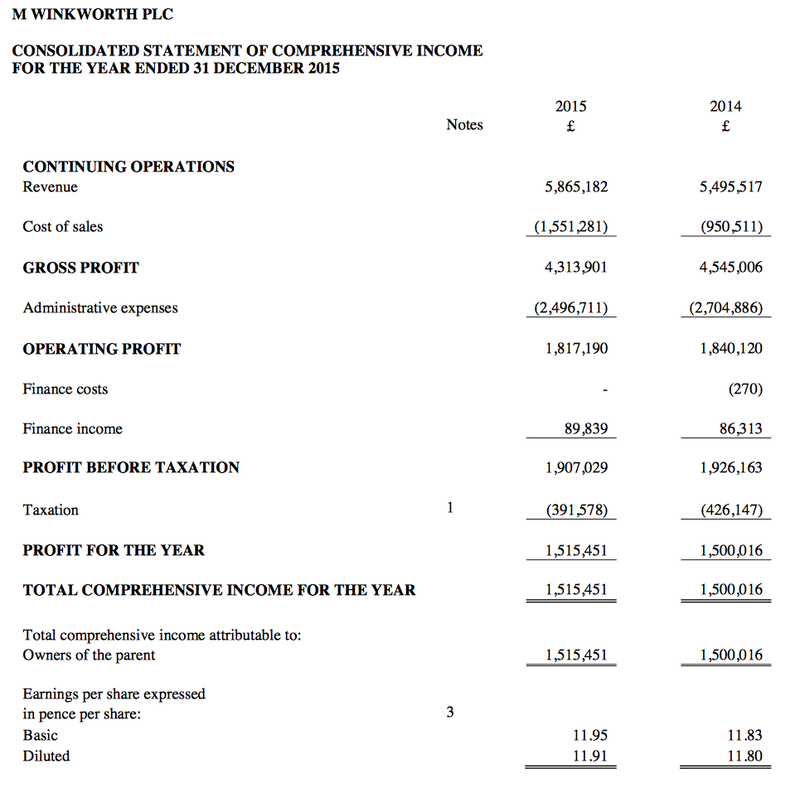 * Taking the 2015 operating profit of £1.8m and applying 20% standard tax, earnings come near to £1.5m or 11.4p per share. * Adjusting the £17.6m (at 138p) market cap for the £3.9m of cash and franchisee loans, I arrive at an enterprise value of £13.7m or 107p per share. * Divide that 107p by the 11.4p earnings estimate and the P/E comes to 9-10. That does not appear expensive given the business has “enjoyed a positive start to the year”. * The trailing 6.5p per share dividend supplies a 4.7% yield. Disclosure: Maynard owns shares in M Winkworth. This entry was posted in M Winkworth, My Shares and tagged M Winkworth, WINK on March 23, 2016 by Maynard Paton. Recruits for the new Client Services and Relocations departments have dampened WINK’s impressive staff stats. The average employee produced £172k of revenue last year, versus £196k-plus between 2006 and 2014. Also, staff costs represented 26% of revenue, versus less than 24% for between 2006 and 2014. I suppose once the new departments get up to speed, WINK’s staff stats may recover to what were impressive levels. I wonder if Mr Agace is now taking a more active role in proceedings. He is a director of WINK’s main trading subsidiary, which I presume would not bother hiring pure non-execs. Christopher Neoh is the finance director and his pay suggests he still works part time. Meanwhile, chief exec Dominic Agace does not look vastly over-paid. Outstanding options represent 2% of the total share count. Some 48% of trade receivables were past due at the year-end. That proportion is not out of the ordinary for WINK, given the figures for 2013 and 2014 were 54% and 43% respectively. I attended WINK’s AGM this morning at the group’s office in central London. A print-out of my online portfolio was enough to get me into the meeting. I was told I was the first ordinary shareholder to attend a WINK AGM since the firm floated in late 2009. The lack of prior AGM attendees may have explained why a non-exec became a little anxious as my questioning progressed. Anyway, in attendance was the chairman, the chief exec, the two non-execs, the company secretary, an advisor and me. The part-time finance director did not show. Presumably he does not work Mondays. * The business did indeed enjoy a bumper December. The chief exec admitted the group had been cautious with its November update, but the franchisees simply found that more transactions completed before the year end. The December figures were not bolstered by significant fees from the initial sale or subsequent resale of franchises. * The chief exec admitted some of WINK’s franchisees required re-invigorating and I got the impression the 8 franchise resales last year were due to the owners under performing. Notably, the company evaluates its franchisees every year and looks to get rid of 6-8 under-performers. Apparently, a fresh franchisee can increase a sub-standard franchise’s revenue from £150k to £400k. Ideally WINK wants its franchises to earn £500k revenue/year (see below). * The chief exec could not recall how much initial/resale franchise fees contributed to the top line last year. Various formulae were cited as to how much a franchise resale could earn WINK (5% of the franchise’s revenue I think is the current basis) and I got the impression the resale fees were not that different to the £20k initial fee stated on WINK’s website. * I made the point that rival AIM estate-agency franchisors, Martin & Co and Belvoir, both offered much greater revenue disclosure than WINK, and disclosed many useful stats in their presentations, too. I said it would be useful if WINK could do the same. * WINK still receives 8% commission from every house sale and letting agreement arranged by its franchisees. But the overall income including fees is now 12% — fees include for example £500/month for central marketing. Also, WINK is charging 15%/20% plus the standard 8% fee on business delivered through the new Client Services and Corporate Relocations departments. * Office openings — WINK’s franchise network has expanded from 86 to c100 branches in the last 6 years. I said that seems like slow progress. The chairman suggested his experience was that in some years it was good to open offices, and some times it was good to consolidate. He made the point that in the early 90s, the business made a greater profit with 35 offices than it did earlier with more than 40. The chairman referred to closing offices in Sheffield as they did not fit in with the group, so the overall office count was impacted by those and other closures. * The chairman also cited the importance of having higher quality franchisees, rather than a higher quantity. A bad franchise in one area could have a knock-on effect on reputation in a neighbouring area. He was keen to ensure franchisees could produce £500k revenue/year, as those earning much less could be susceptible to ‘shrinkage’ (loss of transactions) and fall into financial trouble, damage the brand etc. * One Foxton office may be the equivalent of 4 WINK offices in terms of people, London area coverage, etc, so branch-to-branch comparisons are skewed. Fixed costs of corporate-owned branches (e.g. Foxtons) can look attractive in good times, but not so attractive in bad. * The biggest influence on WINK’s trading performance in the years ahead will be transaction volumes — which are still 25% below the pre-cruch peak. Rising house prices usually go in tandem with rising volumes. * The “upgraded online offering” referred to in the annual report will not be a Purplebricks-type venture and WINK has no intention of offering a cheap fixed-fee service. The chairman made the point that the saving using PURP was not that great for many properties outside the South East. “People still need good service” when selling their largest asset said the chief exec. * The chief exec would not disclose what fees franchisees earn from house sales, and the chairman said franchisees could set what fees they want. The meeting now started to become a little tetchy as one of the non-execs said the answers being given by the board were not being made available to all shareholders, and that the AGM was in fact turning into a normal board meeting given the “level of probing“. I said that I would carry on asking questions and if the chairman and chief exec thought the answers were commercially sensitive, then they could say so and not answer the question. And so after that, the conversation become a little fractured. * No comment on the size of the investment being used to fund the Corporate Relocation and Client Services departments. I said I had looked at the subsidiary accounts, and the Client Services division lost £145k in nine months during 2014. * Loans made to franchisees last 4 to 5 years. No comment on the interest charged. * Chairman did not seem to agree with Note 13 in the accounts that WINK’s franchisees were late payers (48% of trade payables past their due date). The situation was due apparently to timing of rental income. * The absence of the finance director and the interjection from the non-exec meant I decided to drop a few finer questions of the accounts. * The chairman explained he received no extra money last year, just that the reporting of his PAYE differed. The chairman said he was a non-exec, but the chief exec said he acts as a consultant and is “good to have around“. I reckon £100k a year means the chairman is more than a typical AIM non-exec. * During the meeting, the chairman described WINK as a “steady, safe company” more than once and noted the majority of his income depended on the group (via dividends). I liked that. Overall, it was useful but certainly not a ground-breaking meeting. One or two little titbits were divulged but the info essentially dried up after the non-exec (a former solicitor) intervened. I think WINK’s chief exec should have a look at the presentations offered by Martin & Co and Belvoir on their respective websites, and make his own judgement as to the info shareholders should receive. I am not sure what to make of WINK (and its franchisees) sticking with the traditional high-street approach — PURP was described as “just another competitor“. This look positive — a 1.8p per share Q1 dividend. It compares to 1.6p for Q1 of 2015. The declaration appears to underpin the bullish tone of the results above, and follows a 1.8p special dividend paid in January. WINK’s Q2, Q3 and Q4 dividends have always equalled or exceeded its Q1 payout, so I guess the full 2016 payout could be at least 4*1.8p = 7.2p per share. Earlier this month, WINK chief executive Dominic Agace gave a presentation at a Shares Magazine investor evening. * WINK collects the estate-agency commission directly from the property purchaser and then distributes the franchisee’s fee after taking the groups’ 8% royalty. So I wonder why WINK’s books show a lot of trade debtors past their due date. Maybe rental commissions are collected differently. * Average royalty rate is 12% per franchisee, which includes the standard 8% plus other fees such as central marketing. * Average WINK sold price is £645k in London and £541k for all offices. Average fee per instruction for franchisees is £7k. * Islington franchisee bought the under-performing Shoreditch franchise using a WINK loan of £150k — interest payable to WINK is 10%pa over five years. Shoreditch turnover has tripled. * Plans to “revitalise” 25 franchises over next three years. * Corporate Services Department and Corporate Relocations department — lost £120k and £30k respectively in 2015. Plan to break-even in 2016. Talk of fees for WINK of £275k from CSD and CRD combined by 2018. * Group reckons it could add another 50-60 offices in London. Group has a cautious approach to opening new offices — need the right people to protect the brand. * Talk of moving the dividend forward at about 10% a year. * Comment of “Not going to over-gear the business or take too much cash out of it.“. * “Fantastic start to the year” due to stamp-duty changes. I posted the following on another website today. Maybe I am biased but I am beginning to feel PURP’s business plan may not spell doom for traditional estate agents just yet. Re: Purplebricks, I am convinced that the way property is bought and sold will change fundamentally, in the same way as, for example, many of us now by insurance (through the likes of MoneySupermarket, GoCompare etc.). I do therefore expect in a few years time there will be 3 or 4 major internet-only UK estate agents, and PurpleBricks may well be one of them. It is not clear to me whether an online agent or a hybrid agent such as PURP will sell your home more conveniently, efficiently and quickly than a traditional agent. Selling your house of course means having the buyer’s cash in the bank, not just a verbal offer at your asking price. Having the cash in the bank as efficiently as possible involves the agent correctly assessing whether the buyer has the finance available and all the subsequent managing of the chain, paperwork, etc,. PURP’s interim results presentation (https://pbstaging.blob.core.windows.net/web-images/marketingWebsite/investors/media/press/Interim-Results.pdf) indicated the firm had 180 Local Property Experts (LPEs) and that its instruction run-rate was 24,700 a year. In other words, each LPE is handling 137 instructions a year or 2.6 a week. Assuming four months from advert to completion, an LPE may be handling about 40 different property sales at any given time. I am not sure whether I would to compete with 39 other vendors for the attention of my LPE. PURP employed an average of 48 people (excluding most LPEs, as they are generally self-employed) during the year to April 2015. Guessing the employee figure has since tripled to 150, and that LPEs now top 200, PURP may have a total of 350 people looking after 24,700 instructions a year (i.e. 70 per person). For a quick comparison, traditional agent LSL sold 29,311 properties in 2015 — 5,000 more than PURP’s current run-rate. And yet LSL employed 3,935 staff at its estate agency division and, based on a proportion of revenue, I reckon perhaps 1,400 are involved in sales and the subsequent admin of the group’s 29,311 sold properties (i.e. 21 per person). So either LSL is vastly overstaffed, or PURP is vastly understaffed, when it comes to sales and admin employees. Which is it? Well…the fact PURP effectively takes its fee upfront at instruction speaks volumes in my book — I suspect the admin between offer acceptance and completion takes a lot longer at PURP given the LPE/employee numbers involved. Such protracted admin could mean the conversion rate of offer acceptance to completion at PURP is relatively low. And getting the money in the bank is of course the ultimate aim of the house vendor. For what it is worth, LSL’s average selling fee last year was £3,170 ex-VAT or £3,804 inc-VAT. — which is £3,006 more than PURP’s basic £798 inc-VAT fee. If it means a successful and/or more timely completion, an extra £3,006 might be worth paying. Just so you know, I increased my WINK shareholding by almost four-fold during May and June at an average price of 131p including all costs. Using the trailing 11.4p EPS calculation mentioned in the Blog post above, I reckon 131p valued WINK at 8.6x earnings adjusted for the company’s cash and investments (cash of £3,168k, less special dividend payable of £229k, plus loans to franchisees of £1,175k = £4,114k, or 32p per share). In addition, the trailing dividend offers a 5.1% dividend yield. So… why buy more of this share? Well, WINK was by far my smallest holding (<1% of my portfolio) and the single-digit rating essentially prompted me to decide whether the share was worth adding to, or just not bothering with and getting rid. No point in having meaningless positions. The basic attractions to WINK are: i) family-owned/-run firm; ii) simple business; iii) cash-rich/cash-generative books; iv) lowly valuation, and; v) reasonable track record of progress (at least since the 2009 flotation). The downside of course is that the firm is dependent somewhat on housing transactions in London, and a property-market slump will do no favours to any estate agent. At least WINK remained profitable during 2008, and its capital-light franchising operation and dependence on self-motivated/self-employed franchisees ought to keep the firm in relatively good shape during any further downturn. Bear in mind, too, that WINK's last reported profit included £150k of losses (see this Comment) within its fledgling Corporate Relocation and Client Services departments — and these units are expected to break-even in 2016. Refreshing under-performign franchises with new franchisees may also support profit. Plus, good levels of business due to stamp-duty changes earlier this year ought to help the next set of figures. I don’t know whether WINK and other traditional estate agents will lose out to the likes of Purplebricks (PURP) over time. I suspect the fees in the sector will fall, but my study of PURP does suggest to me that this particular hybrid agent is sorely understaffed. I just wonder if the economics of estate agency — where costs have to cover post-offer admin staff etc to help with chains and get the sale completed — is actually suitable for cut-price online fees. Migration to online agents is not as obvious to me as the migration to online insurance comparison. Anyway, let’s see what happens. Fingers crossed things work out.